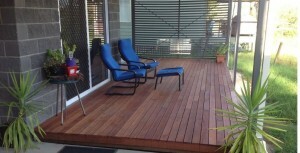 All We Do Is Decks are specialised deck and patio builders who design and construct quality timber patios at affordable rates for Brisbane residents. We use a broad range of different materials such as treated pine and hardwoods. We also build eco patios using composite wood. We can design your patio for you, obtain the necessary Council approval and build your patio using quality workmanship. If you are looking for patio designs or patio ideas have a look at our Patio Gallery to see some of the excellent patios that we have already built. People most often equate patios to structures made from brick concrete, pavers or stone. However there is no reason why you should not have a timber or composite patio – and many reasons why you should have a timber patio. Patios are usually level with the ground or slightly above the ground, but not elevated like a deck. If you are looking to build a patio please go to our Hardwood Decking Page, Treated Pine Decking Page or our Composite Deck Page. There are many advantages to having a timber or composite patio over that of the stone, brick or concrete patios. Firstly decking is softer and easier for little (and big) feet. A wooden patio is not as cold as concrete or pavers. 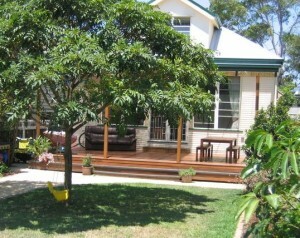 Timber patios blend in well with the garden it is located in. If you have a timber home, then a timber patio would be very complementary to your home. Timber is a cheaper material than stone or pavers so your timber patio should be more affordable. Having an outdoor patio extends your living area and allows you to dine, entertain or relax outdoors and enjoy many of our beautiful Brisbane days. This is especially true when you have a covered patio which would protect you (and your outdoor furniture) from rain and strong sunrays. If your patio has a well designed patio roof you can also have external lights fitted and one or more ceiling fans installed. If there is a need for privacy for your patio we can also design and build patio screens for you. There are several different options for outdoor patio roofs. Firstly there is the option of the different materials and secondly the pitch of the patio roof. 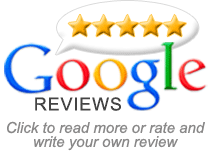 As deck and patio builders we have built all of the various different patio roofs and know the pros and cons of each. Many people choose a timber patio roof to complement their timber patio. Colourbond patio roofs are also very popular. Both in our opinion can be very aesthetically pleasing as well as being very functional. The pitch of a patio roof also allows a great deal of choice. Patio roofing can be designed to match the house roof or can be completely different as a feature. Naturally flat or sloping patio roofs are cheaper to construct than a pitched roof. The current trend in house roof designs is for a sloping roof, allowing you to complement this design with your patio roof too – providing an excellent investment being an affordable yet stunning patio design. 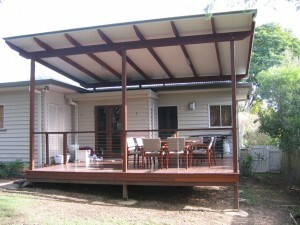 All We Do Is Decks are experienced and skilled Brisbane patio builders. You can rely on us to have great patio ideas and patio designs for your particular needs and desires. We will examine your garden, the external of your home and the site for your planned outdoor patio. We can then draw up the patio plans, and with your agreement submit them to Council. Once the patio plans have been approved we would then construct your chosen wooden patio using quality materials and expert workmanship – and all for a very affordable price. If you are considering a new timber patio, you may also want to consider including bifold doors and/or bifold windows.